Baby, it’s cold outside! Whew! Nothing like taking a photoshoot in almost freezing temps! And in a thin red dress at that! I couldn’t resist this frilly red mini dress when I saw it on Zara, and thought it perfect for the Holiday season or perhaps NYE. I have shared a HOLIDAY look 1, Holiday Look 2, this and will also share my LBD later in the week for the 4th Holiday look. I plan on sharing more looks in faux-leather pants and jeans after the Holidays. But this one called for a bit of dressing up! I did finish wrapping presents this weekend, as well as putting up the tree. I started to write my packing list for Pittsburgh, as we will be visiting this year with my Mom, two brothers and their wives, and a total of 4 dogs. It should be fun! This will be the first year without my Dad at Christmas and I really miss him. Its hard to picture him not being there with all of us. I do reminisce about some of the Christmas traditions we used to enjoy as kids, such as seeing the decorated and themed windows in Kaufmann’s department store in Downtown Pittsburgh. They were magical and just got you in the spirit of the Holiday. 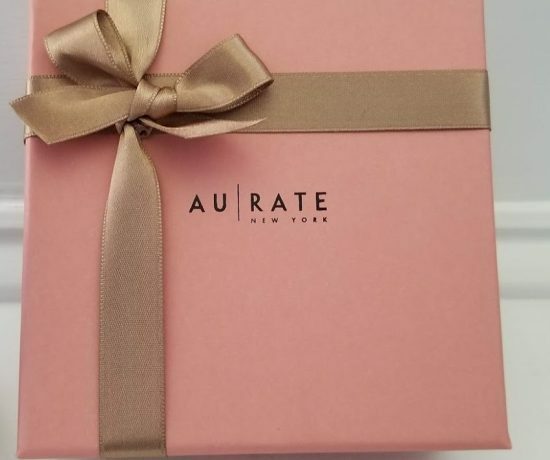 For me, I get excited to give gifts, and can’t wait to pass out presents to my family, sit around a roaring fire and enjoy a Holiday cocktail. I can’t wait to see Gibby and Trufles interact with Jack ( the french bulldog) and Pedro ( a herding dog). My mom will be having only “fur-babies” over this Christmas. Do you own a LRD or do you prefer a LBD on yourself for festivities? What Holiday activities do you miss that you enjoyed as a child? So now it’s time for us to Party! 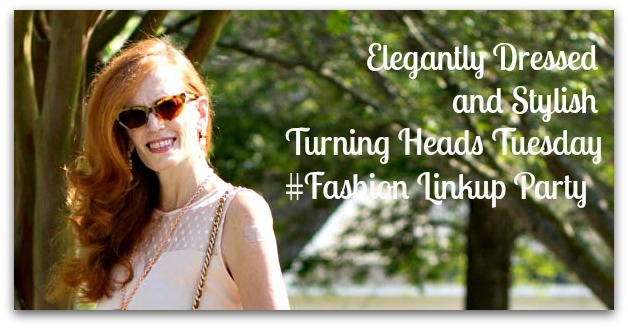 Let’s enjoy the Turning Heads Tuesday Linkup and have fun visiting ! Please comment on 2 posts per blogger, a great way to meet other ladies. Thank you for your comments, they make my day! Busy today so I will feature ladies next week! Thank you! Thank you Amy, I do enjoy dressing up. I do feel, however, I will be due for some casual dressing after the Holidays. Thank you in regards to my Dad. Yes, it is still hard for me to beleive! Ah, what a nice memory! You too enjoy yourself Amy with your family, wishing you the best! Brrrr…. Buffalo! 🙂 I know Pittsburgh will be cold enough! Jess, you look so gorgeous in this LRD. Love the necklace, love the shoes – you can wear this glamorous outfit anywhere. Perfect colour for Christmas, this red dress is sure to turn heads my beautiful friend! You look gorgeous in red! Loving those flats! Gorgeous dress and I love the tights!! I just love that fun dress! There are so many pretty details! you just blew that whole myth about redneads not wearing read right out of the water…that look is weapons-grade awesome! You do indeed look amazing in RED!! And the cut of that dress is amazing – great outfit. Happy holidays! Wow Jess, you look stunning in red! I love the frills on the dress and that black bib necklace is perfect for it. I haven’t a clue about what to wear on Christmas Day, I don’t get dressed up so it’ll probably be sparkly casual rather than all out glam. You look amazing in this! Your legs are gorgeous. Jess you look stunning in this red dress and I love the statement necklace as well. Perfect for the holidays too! 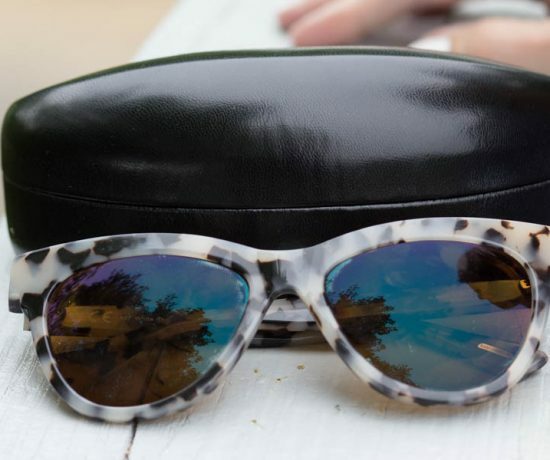 You look amazing in your LRD! I love every detail. 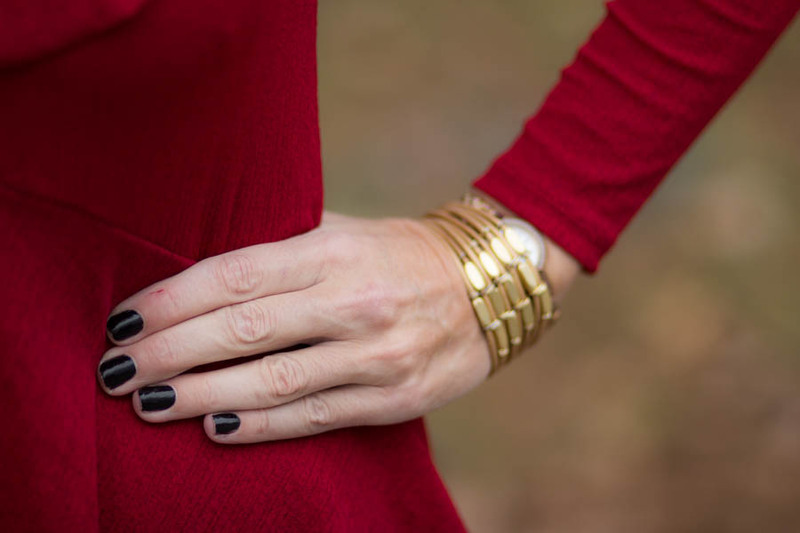 Love this bright holiday red on you, babe! Such a gorgeous dress for the holidays! Love your stockings. No, I don’t own a LRD, but my daughter does. If I ever need one, I’ll just borrow hers. Wow, what a beautiful outfit! 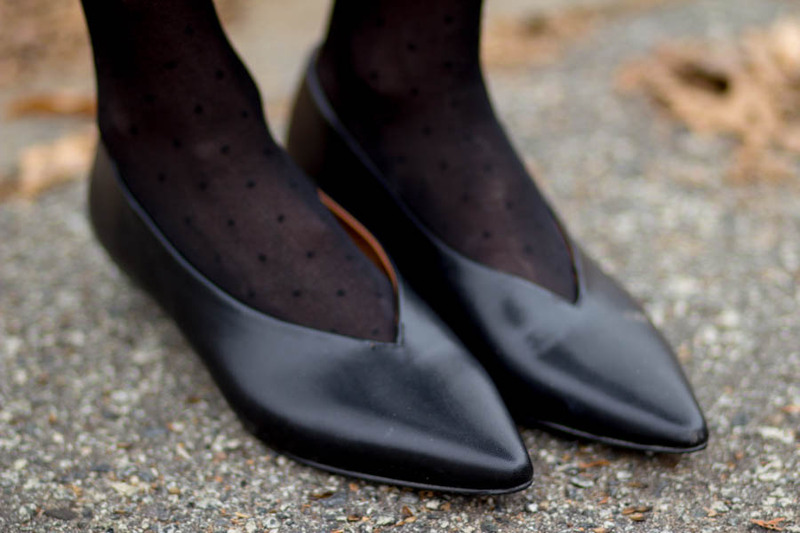 Right down to the cute flats. The dress is amazing. I would definitely wear this dress to mass too for Christmas. It’s so festive and gorgeous! The ruffles are such a nice added detail too. Have a great week, Jess! You are wearing the most festive LRD around Jess! I think this dress is exactly what every woman should wear Jess….so much more lively than our LBDs!! However, I’d be layering at least 2 or 3 things under that if it’s thin like you say!! I even put on 3 pair of hose to try to keep warm in these colder months!!! I have been thinking of adding a LRD to my wardrobe just haven’t found the right one. Your LRD look is darling … the statement necklace and dotted stockings are perfect additions for the festive season. I recall the first Christmas without my dad … sending you lots of hugs. Yes, it will be different – but know your dad will be there in your hearts and memories. Hugs, C.
That’s a beautiful dress, and it fits you perfectly! Lovely choice for the holidays! Sounds like you’ve been productive! I’m glad that you get to spend time with your mom and your brothers as you adjust to the holidays without your dad. I’m thinking of you! 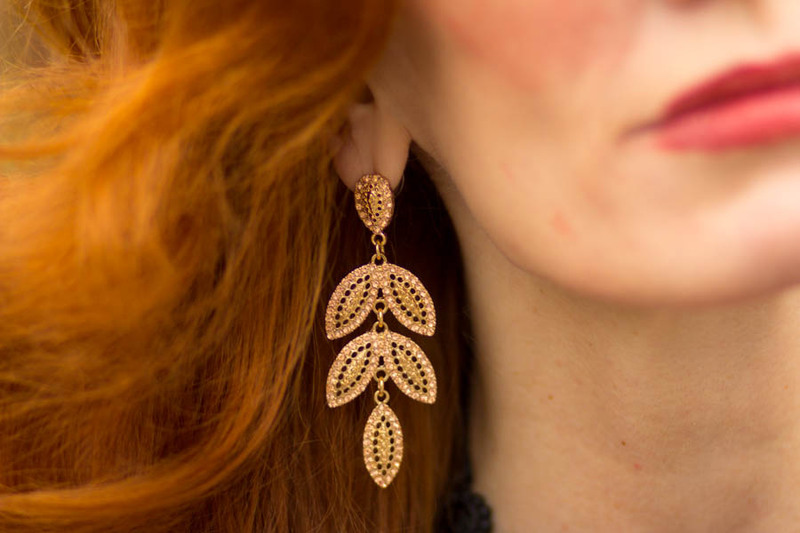 Gorgeous color…perfect for the holidays! Thanks for hosting Jess! LOVE that dress! It’s sooooo perfect! I’m all about a LRD instead of a LBD! Thanks again for hosting! Beautiful as always, Jess! So elegant! I love this complete outfit. You look so classy and beautiful. Love reading your blog. Striking and STUNNING!!! The most beautiful red festive dress on the most beautiful lady!!! That dress is such a unique style. It’s super flattering on you. I love the tights and necklace you paired it with too! Jess~ That dress is just…wow! You look absolutely stunning! The color, the fit, the accessories; absolute perfection. You look absolutely stunning in red! Love the accessories too! Thanks for hosting, lovely lady! Your little red dress is beautiful! I love the ruffle/layer detail, really nice. It sounds like you’re going to have a wonderful Christmas! My in-laws got a new dog that our dog doesn’t entirely get along with…so Christmas with all of the puppy “cousins” together will be interesting! haha! 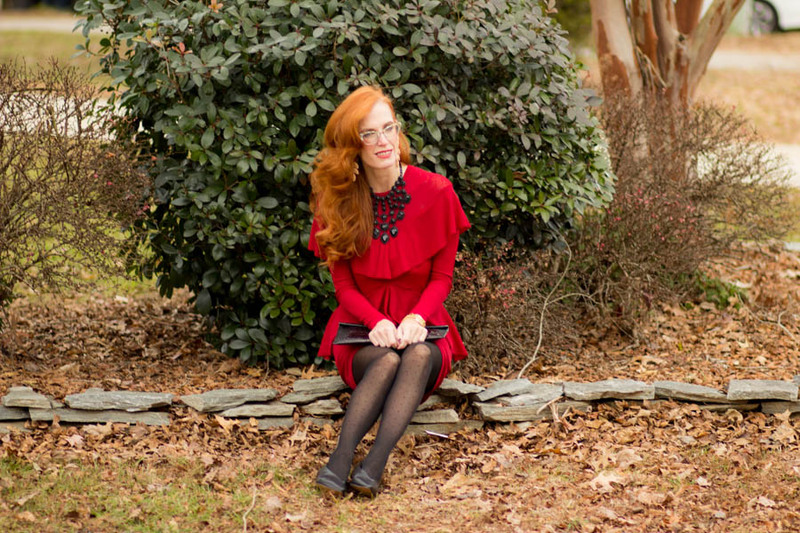 I have enjoyed each of the outfits you have chosen for the holidays, this one is gorgeous with its ruffles and red always seems perfect for a Winter Christmas. Your family Christmas sounds lovely and you will all support one another for this first time without your Father, a time to remember and share those memories. Jess, you look lovely and I adore the angled ruffles on your dress. It sounds like you’ll have quite the Christmas celebration. My sympathies to you as you adjust to new traditions. Thank you for sharing your style inspirations and for the link up.